With the 2017 general legislative session just underway, already much of the buzz around education is centered on money — specifically, whether or not lawmakers, the governor or citizens themselves will support a tax increase for education funding. While a potential tax increase is a significant issue, and a good-old-fashioned political rumble will certainly dominate the headlines, Utahns must not be lulled into thinking money alone will make Utah education all that we want it to be. In today’s dynamic marketplace, businesses no longer have the luxury of simply hoping the education system sufficiently prepares the needed workers. Additionally, schools can no longer prepare students for an ambiguously defined career. The two have to work together as true partners. Ask any student what they don’t like about school and they routinely say they don’t think it applies to their future careers. 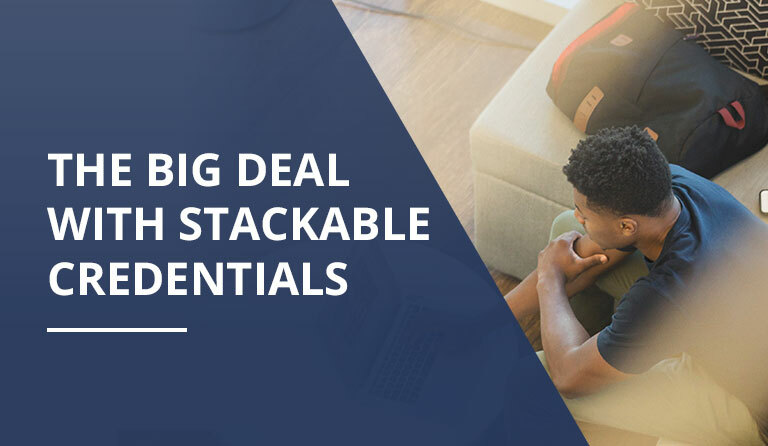 When asked what they want from students graduating from both high school and college, business leaders emphatically indicate they want students who can apply what they’ve learned to real world situations. Career and technical education courses have proven to bridge that gap while improving overall core education results. 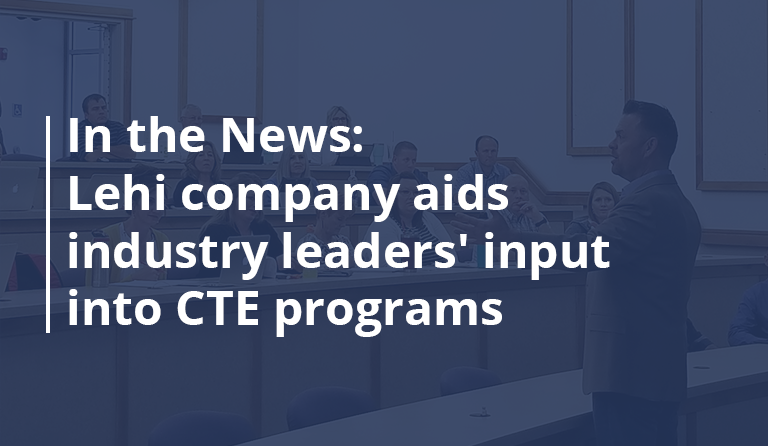 One proven successful way to align the workforce with the demands of industry is by increasing our focus on career and technical education (CTE). CTE courses transform common education subjects into career-focused learning opportunities. Math comes alive while performing engineering calculations in a computer design or manufacturing class; students apply core science concepts in a medical forensics class; and students can confidently answer the question “why did I learn that in English?” when they develop a business proposal for their marketing or entrepreneurship class. In several recent surveys, business leaders have made it clear the shortage of skilled workers has become one of their most significant challenges. That, coupled with their natural inclination to improve their communities, has business looking for ways to strengthen and engage with local education to better prepare students for the jobs available today and will have tomorrow. Businesses don’t want to dominate the education conversation, but they have much to give and share in ways that don’t involve taxation. One high-profile example is the tremendous efforts of the governor’s office, the state’s CTE education communities and the Utah Aerospace Pathways group. This group of Utah aerospace manufacturers, including Boeing, Harris, Hexcel, Hill Air Force Base, Janicki and Orbital ATK, has implemented a joint program to invest time, effort, equipment, expertise and dollars into our schools to train students for lifelong aerospace careers. The excitement around this program is palpable among the participating students, teachers and businesses as they work together for the ultimate win-win. This kind of industry involvement can happen across Utah with just as great of results. More of this collaboration is needed. More of this is wanted by students, educators and businesses. Let’s provide leadership that encourages this type of collaboration regardless of legislative actions. Utah’s graduation rate has increased by nearly 10 percent over the past five years. Gov. Gary Herbert has set the goal to improve that measurement to 90 percent. If we can do it, Utah will have the highest high school graduation rate in the nation. CTE can help us achieve that goal. On average, students who participate in career education pathways graduate at a 15 percent higher rate than their peers. And minority students do even better, graduating at a 20 percent higher rate. Whether or not education funding is increased, limited public resources must be maximized. Utah does not and will never have money to waste. Maximizing every dollar appropriated to public and higher education must be the hallmark of the best-managed state. Getting 15-20 percent increases in graduation rates by focusing on programs that are already implemented provides an area where we can maximize dollars and results. Our students deserve every opportunity to succeed, and that takes more than money. It requires our best effort and smartest thinking to help them see their potential and to reach it. This year, let’s focus leadership efforts on proven methods that engage students in their learning and that excite businesses and educators to work together to that successful end. Mr. Barton’s career has been dedicated to the education market, with a focus on Career and Technical Education, standards development, and high-stakes examinations. Prior to founding Precision Exams, Mr. Barton was the CEO and co-owner of ProCert Labs, an education standards and curriculum alignment and validation organization. While there, Mr. Barton ran a project that gathered and mapped all 50 state standards together for Kindergarten through 12th grade Math, Sciences, Language Arts, and Health curriculums. Edson Barton enjoys camping with his wonderful wife and four children in Utah’s beautiful high mountains, scenic red rock valleys, and amazing desert landscapes. 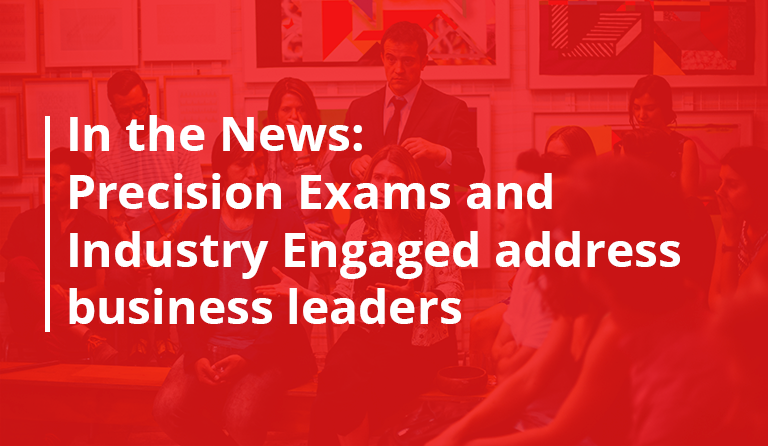 Precision Exams and Industry Engaged — address business leaders, employers, and educators about the importance of industry and education coming together.